Knit ear bonnet to keep the flies out of your horses ears and to provide for added visibility. Currently OUT-OF-STOCK. Leather chin strap with stainless steel hardware Premium Leather care! This is the product we use here at our own Saddle shop in Lowry City, MO. Leaves leather soft and supple! • Does not darken finished leather. • Conditions, cleans, polishes and protects. • Recommended for exotic leathers. • Ideal for leather restoration and deep conditioning. 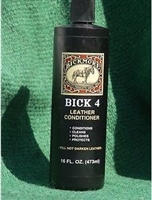 Bick 4 Leather Conditioner is specially formulated to condition, clean, polish and preserve all smooth finished leather. It is ideal for reconditioning old or dry leather. It is recommended for all leathers even exotics. Bick 4 will not leave a sticky or gummy residue behind. Try it on your leather clothing, as we as furniture, car interiors, purses etc. Always check for colorfastness in a hidden area before using. If item is very dirty, clean it with Bick 1 Leather Cleaner first. Then apply Bick 4 liberally with a cloth. Let dry and buff. Repeat as necessary. Do not use on suede, roughout or napped leathers. Some Rigging Items are Made to Order. Please allow 2-3 weeks for completion. Some Rigging Options are Made to Order. Please allow 2-3 weeks for completion. 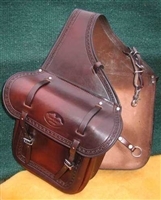 Crest Ridge Saddlery's innovative swell bag fits any of our saddles. It attaches in front of the pommel with generous leather straps and stainless steel buckles. This bag lets you keep small items handy right in front of you. The bag is curved on the bottom to avoid hitting your horses withers. These Cordura fenders are the same fenders that come standard on our Lite and Ultra-Lite saddles (except Sinclair models). They are made from heavy duty Cordura in our own sewing shop. They are tough and easy to clean. Available in both black and brown. Our Weekender saddle bags are made from the same tough Cordura used in our Lite and Ultra-Lite saddles. These roomy saddle bags come standard with two side bags a large center bag. The side bags and the optional bottle holder are insulated.The large nylon zippers are strong, yet easy to use. Bottle holders and a cell phone pouch are available an optional upgrades. We use stainless steel eyelets for quick attachment to most any saddle. The back strap is curved and fits all Crest Ridge Saddles. Copyright © Crest Ridge Saddlery, LLC.